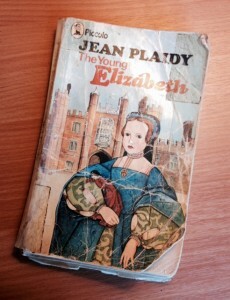 My most treasured possessions include a battered little paperback, barely held together with sellotape: TheYoung Elizabeth, by Jean Plaidy. Published in 1961, with a cover showing a picture of Hampton Court Palace, it tells the story of the childhood of the future Tudor queen. She’s forced to display resourcefulness and mental strength to reach the throne. She also has a weakness for dresses and finery. I was hooked. Plaidy’s first chapter sees Elizabeth being taken to the christening of her younger brother, the future Edward VI. It’s thirty years since The Young Elizabeth was my favourite book in all the world, but the scene has certainly stuck with me. I now work as a curator at Hampton Court Palace, and one of the best things I’ve done in the last year, for a BBC documentary, was to help re-stage that very same christening ceremony, persuading nearly 100 of my colleagues to dress up in tights in order to bring back to life the Tudor age. So I’ve always been passionate about the Tudors, and this past week – with the broadcast of Wolf Hall – it seems that the rest of the world has been swept away too. Among my fellow historians this sort of thing always arouses a certain amount of tut-tutting. ‘Not Henry VIII again’, they sigh, ‘there are other interesting periods as well.’ But none with quite such a serendipitous rollercoaster of a story. If you made up the tale of Henry VIII’s six wives, no one would believe you: divorce, followed by beheading and then a tragic early death, another divorce, another beheading, and then the final lucky one – Catherine Parr – who got away, and survived the old monster’s death. But as well as the bloodstains and the melodrama, at least part of the reason that we feel drawn to these people is because of the genius of Hans Holbein the Younger. He had an uncanny ability, through his drawings, to make you feel like you are meeting a real person. The art that followed is less realistic, more diagrammatic, and has the effect of making the later Tudors and early Stuarts seem much less knowable. For me, though, and for the many readers of historical fiction, the period’s greatest attraction lies in its leading characters. Henry VIII himself is blood and fire while his daughter Elizabeth is ice and steel. Yet I think the figure in the dynasty who deserves more attention is Mary I, who had the misfortune to be on thelosing side of history. Because she was resolutely Catholic, Protestant historians have given her a good kicking. And yet Mary I successfully seized the throne at the head of an army, reigned with confidence and cunning, and died peacefully in her bed. Her big mistake was to marry an unpopular and foreign prince, and then, tragically, to fail to have children. But it seems to me that even this had value. It taught her younger sister, Elizabeth, which mistakes to avoid. I never guessed, reading The Young Elizabeth, it would have such an important influence upon my life and career. But today, in the year that Hampton Court Palace celebrates its five hundredth birthday, it’s a privilege to be sitting writing this in the very rooms where Elizabeth visited her baby brother as he was washed and rocked by his nurses. It’s a bittersweet image, as Edward would die at only fifteen, coughing up his heart from tuberculosis. And here lies perhaps the essence of the Tudor age’s dreadful glamour: the drama, the pathos, the horror, of an early and awful death. It was *years* – well into adulthood – before I discovered that Jean Plaidy and Victoria Holt were one and the same…so shocked! I LOVE that you’ve mentioned Jean Plaidy! Everyone seems to have forgotten about her! Years ago, when I was studying A level History, our History tutor (a bloke) recommended that we read Jean Plaidy – to get feel for the period. Her books were a cracking good read and actually quite well-researched. I’m afraid I prefer her retelling of history, to the more recent Wolf Hall! Sincere thanks, Lucy, for thr refreshing way in which you have renewed and re-energised the interest of this 85year old admirer of yours in all things Tudor. Long may you continue ! I’ve always thought real life was a much better story than any fiction could be. Had great fun at Hampton Court a few years back looking for the inter-twined “H&A” motifs the stonemasons, in their hurry to erase all trace of Ann Boleyn, had missed. Thank you Lucy – Hoped you watched the recent documentary about Holbein. I also find the Tudors fascinating. I am going to London in March and will be in awe once again as I walk through Hampton court . Just to know that the Tudors walked on the very ground I shall be walking excites me to no end!! I had hated history in school. Too much rote memorizing of dates and battles. Jean Plaidy’s books brought history to life and made me realize how fascinating can be. I haven’t read one in years though. I’ll have to check them out again. Just saw Britain’s Tudor Treasure: A night at Hampton Court. Wonderful show. I look forward to your next project. I loved Jean Plaidy too. But as to which of Henry’s wives was luckiest, i don’t know. catherine of Aragon had all his best years, when he was young and fit and goodlooking. And Anne of Cleeves survived him longer than Catherine parr did. I agree with you about Mary though, she’s had a bad press. I can well imagine the feelings you have at Hampton Court Lucy they must be very moving. The Tudor period was certainly a very impressive time in our history. Well written by the way. Is this Jean Plaidy Paperback series in circulation for young people to read perhaps in 2015 onwards? It a very inspiring book and in tune with modern interests. Best wishes. My English teacher when I was 13 in 1972 , recommended reading Georgette Heyer and Victoria Holt back then. I didn’t realise that Jean Plaidy and Victoria Holt was one and the same person? What POWER there was in the fact that you said that you were writing in the very rooms in which Elizabeth visited her baby brother! I saw the Coronation on TV when I was 5 & was fascinated by The Queen. She has been my North Star ever since. A year later, my family moved to England for three years and I never recovered from being Entranced with your history. You present all aspects of it with such attention to how people actually LIVED and FELT–and with a twinkle that assures the audience that you are NOT a pompous, academic ego! About ten years ago my mum gave me both ‘The young Elizabeth’ and the ‘Young Mary Queen of Scots’, and I adored them! They encouraged me in my love of both historical fiction (Jean Plaidy is a recurring figure on my bookshelves) and history in general – so much so I’m now applying for a degree!